MLB World Series 2016 Chicago Cubs 3 Gallon Gift Tin - $23.99 - GolfersEdgeOnline.com - Best Golf Equipment On The Web! Officially licensed gift tin. These metal decorative tins are great containers for gift giving. The tin is 11.25" high with a 10" diameter, and 3 gallons for the tapered style. Made in USA. 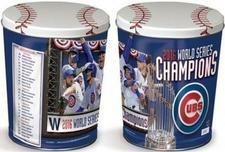 If you have any more questions about the MLB World Series 2016 Chicago Cubs 3 Gallon Gift Tin; do not see the model you are looking for; need custom options; or prefer to not purchase online, then please call us at (630) 656-1291.